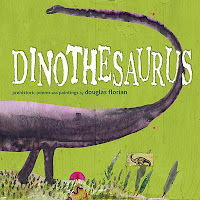 Dinothesaurus: Prehistoric Poems and Paintings by Douglas Florian. Y'all already know that I'm a huge fan of Mr. Douglas Florian. Well, his latest book does not disappoint. Dinothesaurus is a collection of poems about (what else?) dinosaurs. With his signature word play and detailed paintings, this collection is sure to please young dino-fanatics. Each spread contains a painting of an poem about a different dinosaur from the ferocious T-Rex to the gigantic seismosaurus to the tiny micropachycephalosaurus. The paintings have lots of funny little details that make them so much fun to look at closely and each painting is different from all the rest. Um, I tried and tried to pick a very favorite, but I couldn't because I love so many of them. They pterrorized the pteeming air. And one thing that librarians (and anyone who read aloud) will be happy to find is a pronunciation guide that accompanies each dino poem. Thanks, Douglasaurus! Head over to his blog to see more excerpts and spreads from the book. And then go pick this up for your favorite dino-fan.